Ptisp Review 2019: Is Ptisp a Good Hosting? While not really well-known globally, PTisp is one the three largest hosting companies in Portugal. They offer hosting that goes beyond the basics and provides web designers the freedom to create their best site without having to go over budget. PTisp has been hosting websites since 2001 and has operations in both Spain and Portugal. Since then, they have hosted over 50,000 domains and presently have over 11,500 active customers around the world. They offer affordable hosting with tons of storage, unlimited bandwidth, and the flexibility to handle any site you want to create. All plans at PTisp come with at least 20GB or more in storage and other excellent base features that include Softaculous for auto-installs of WordPress and over 400 apps. Below are just a few of the basic features. PTisp offers much more than other providers, providing support for the hottest web programming languages, Cloudflare protection, and more. Here are some of the features that help set PTsip apart from other providers. PTisp’s cPanel setup is fairly standard, but it doesn’t include a website builder. For beginners, your best option is the Softaculous auto-installer. This will install WordPress and other tools that can help you build websites. However, you will need to code some, so if you’re not comfortable with coding at all, then you need to look elsewhere. More advanced users will have little problem with PTisp, and the freedom to code in Python and other languages will help you create a killer website. The available storage on these plans is fantastic, meaning you should be able to host most any size website. However, there are two things you need to consider when using this host. First, you do not get a free domain with any paid plan. Also, the basic SSL certificates have no support from PTisp whatsoever. You’re ultimately in charge of any issues and renewals. Next, you can easily upgrade from one plan to another, but you cannot downgrade except when it is time to renew your hosting. PTisp offers solid support with live chat, phone support, and email support. They also provide an extensive knowledge base. However, there is a big problem with phone support. You must pay to use their phone support and it is a per-minute charge. It is more expensive to call support from your mobile than over a landline. Also, it appears that chat support is only available to those with a paid account. I’m not a fan of the paid support option and would recommend staying with live chat and email support whenever possible. 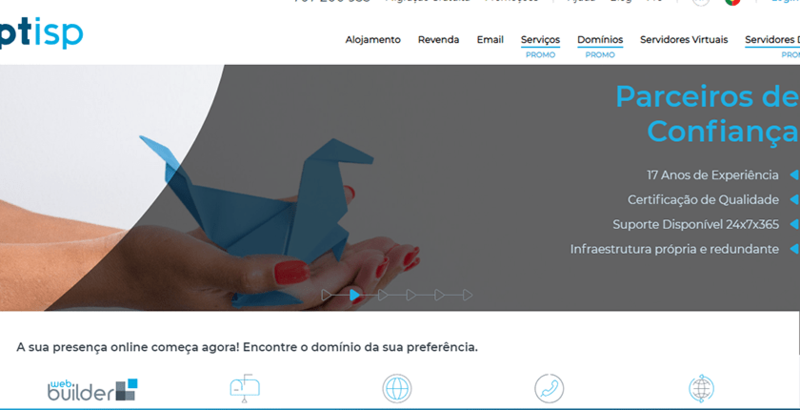 PTisp is a lesser-known host that has carved their niche in Portugal but is beginning to be noticed by webmasters around the world. They offer hosting affordable for all budgets with features that are typically unavailable without expensive upgrades. Wondering how Ptisp stacks up against other Web Hosting companies? Enter any other Web Hosting company and we will give you a side-by-side comparison.